Empowering women around the globe. Delivering on the promise of a better tomorrow. Transforming lives with technical know-how. Corinne Reilly is a writer on Pact's communications team. Sein Win May has spent more than her share of time in the dark. At 51, she has lived her whole life in Shin Hla, a remote village of about 600 people in Myanmar’s Dry Zone that is accessible only by boat. Like most of the rest of the country’s vast rural stretches, Shin Hla has no grid electricity. Sein Win May never married or had children. She supports herself. For the past two years, she’s done it by running a small shop attached to her modest house, where she sells cooking supplies, dry foods and snacks. If Sein Win May wanted to work before sunrise or after sunset, she did so under a single dim lightbulb connected to a battery. And that was in the best-case scenario. Her batteries drained quickly, and charging them was time-consuming and costly. Often, like most of her neighbors, she simply went without power. Rural and accessible only by water, Shin Hla lacks grid electricity. Then last spring she heard about a new option. Pact was helping villagers buy solar home systems. Sein Win May had heard of solar panels before, but no one was selling them near Shin Hla. She wouldn’t have been able to afford a system anyway – even a small one – and she wouldn’t have known how to use it or what kind was best. What if she got ripped off? What Pact was offering, though, seemed doable. The systems were affordable, especially compared to other lighting options, and they could be paid for in manageable installments. Most important, Sein Win May trusted Pact. The organization had been working in Shin Hla for years, leading a development project that had significantly improved villagers’ lives, particularly in the areas of health, livelihoods, water, sanitation and access to credit. In fact, it was because of WORTH, a Pact economic empowerment program that helps women start small businesses, that Sein Win May had opened her shop. She was tired of closing at sunset and counting the day’s earnings under that dim bulb. I want more, she thought. Shin Hla’s Village Energy Committee, newly formed with Pact’s help, was making a list of who in the community was interested in solar power. Sein Win May decided: I’m in. It was Pact’s on-the-ground experience in Myanmar that led the organization to launch Ahlin Yaung. 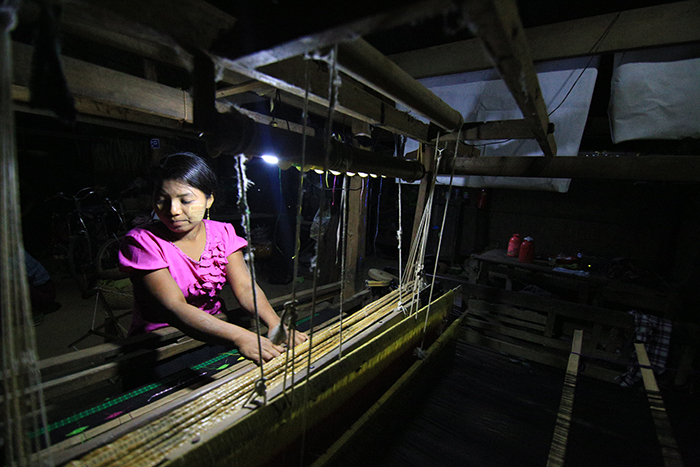 Meaning “light” in Burmese, the project is working to bring renewable energy to 1 million people in rural villages by 2021. Pact had been working in Myanmar for years when, in 2011, it began an ambitious, wide-ranging development project called Shae Thot, or “The Way Forward,” with funding from USAID. Central to Shae Thot were Village Development Committees, or VDCs, comprised of democratically elected village members. Pact helped each VDC launch a fund to be used for village development projects. Starting with a little bit of seed money, VDCs grew their funds by making low-interest loans to community members. They used proceeds to pay for projects they decided on with their villages’ input, such as roads and schools. Other data supported that picture. Despite government efforts, about 70 percent of rural Myanmar has no grid electricity, and in villages that do, blackouts are routine. Research has shown that affordable, modern energy drives development, while its absence perpetuates cycles of poverty and limits progress in areas from education and livelihoods to health and food security. With funding from Chevron, Pact launched Ahlin Yaung in 2015. Other corporate partners soon joined the effort, including Shell and ABB. Rather than selling solar home systems itself, Pact brings communities and suppliers together and supports households to both be able to afford systems and to make the most of them. After purchases, Pact makes sure suppliers deliver quality systems. Critically, Pact also provides loans to pay for systems, which cost households the equivalent of about $60 each. They pay 10 percent when they order a system and the rest in installments over the next nine months or so, at 2 percent interest. Interest proceeds go to communities to add to their development funds. The principal goes back to Ahlin Yaung to provide energy loans in new villages. 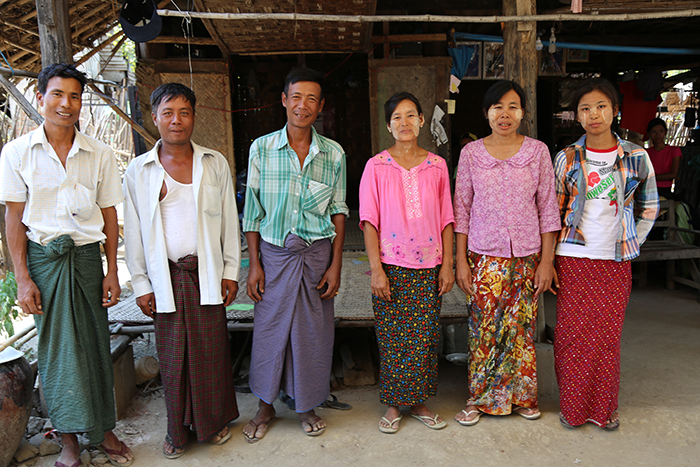 Village Energy Committees comprised of community volunteers help with Ahlin Yaung’s planning and administration, including collecting loan payments. Supporting households to buy systems, rather than giving them away at no cost, is important, Joukes says. So far through Ahlin Yaung, more than 200,000 people across central Myanmar have gained access to electricity, through solar home systems as well as through the electrification of community-prioritized places. Of the more than 10,000 households that have installed home systems, about half say they are using the electricity to be more productive, such as running businesses longer and more efficiently. About 80 percent say their children, now able to read and study past sunset, have gained educational benefits. 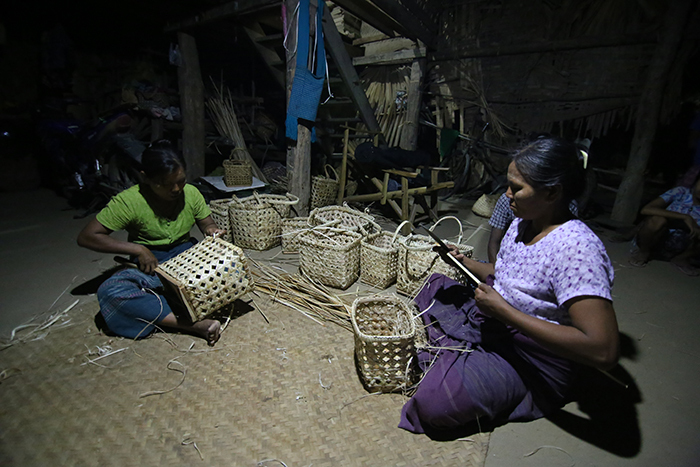 Small business owners in Myanmar are now able to make productive use of their evenings. Compared to energy and light sources they were using before – including wood, kerosene, candles and diesel generators – solar is cleaner, safer and considerably cheaper. More than once when it was windy, Khin Mar Cho says, her family’s house briefly caught fire. Last year, she installed a solar home system with Pact’s help. Now she works on pots for her pottery business later into the evening, which has helped boost her profits. She recently made her last payment on the system and is spending far less on energy than before. She no longer has to pay a neighbor every time she needs to charge her cell phone. “The solar panels are better for us,” she says. 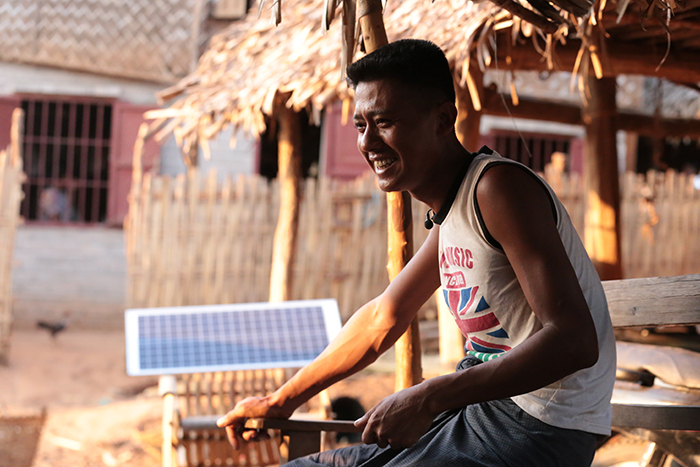 U Mya Thein, a farmer in Salin Township who recently installed a solar home system, says electricity has transformed his evenings. Now that his living room is lit, friends gather there all the time after dinner. “I’m very fond of this,” he says. For all of the benefits solar home systems have brought, though, it isn’t enough. It’s why Pact is expanding its renewable energy work in Myanmar to include rural solar mini grids. With mini grids, local private partners build the grids, which communities share, paying for energy based on household usage. Pact fills a role similar to the one it has played with solar home systems – bringing communities and mini grid developers together, educating communities, and helping communities finance start-up costs, such as connecting to mini grids. Pact also coordinates with Myanmar’s government, ensuring its efforts align with national electrification plans, and works with communities to help them create practical, relevant energy strategies. With funding from Shell, Pact recently saw through its first solar mini grid project, in southern Myanmar, and more are underway. A Pact-supported solar mini grid in southern Myanmar. Pact is also expanding its renewable energy work beyond Myanmar. The organization recently launched a global program called Energy for Prosperity that will grow Pact’s efforts to improve access to energy as part of its integrated approach to development. “We know that clean, reliable and affordable energy is essential for development, and we see Pact as uniquely positioned to work with local communities throughout the world to overcome the challenges that have thus far prevented more than 1 billion people from gaining access to this basic resource,” says Matthew Cullinen, Pact’s senior director for renewable energy. It’s a little past sunset in Shin Hla, and Sein Win May is switching on the lights at her shop. It’s been about eight months since she installed her solar home system. She is just about finished paying it off. Absolutely, she says. As soon as her system was up and running, she began keeping her shop open later. With higher sales and profits, she has expanded her offerings, and plans to keep going. “I am earning more and more,” Sein Win May says, and those day-long trips to charge batteries are a thing of the past. “It’s so easy to turn the power on and off,” says her friend and neighbor, Wai Wai Aung, who installed two systems to light her home as well as a small tea shop she runs. In all, about a quarter of Shin Hla’s households now have solar. “Before, when I used a diesel generator, I needed help to start it, and it was loud and smelled,” Wai Wai Aung says. Shin Hla now enjoys bright light at night. With solar, she can begin preparing for her customers well before sunrise, which works perfectly, as her tea shop does most of its business in the morning. Why didn’t she get a solar home system sooner? Before Pact, she says, she didn’t know they existed. Help Pact build promise and improve lives around the globe. Let us know the promise you’d like to make. We’ll help you keep it. Sign up to receive news and updates from Pact. Inside Our Promise, Pact's e-newsletter, offers the latest on our integrated, adaptive approach to development and our effort to end poverty and marginalization around the world. © 2018 Pact. All rights reserved. Site by Ai.